This is a new concert instrument with silkscreened artwork inspired by 50’s & 60’s era instruments. It’s a super high quality and well finished instrument built from quarter sawn super Curly Western Big Leaf Maple for the body and the neck. The soundboard is a bearclaw figure Sitka Spruce. The artwork is screen printed on the soundboard and sealed in with lacquer top coats so the artwork will never rub off. 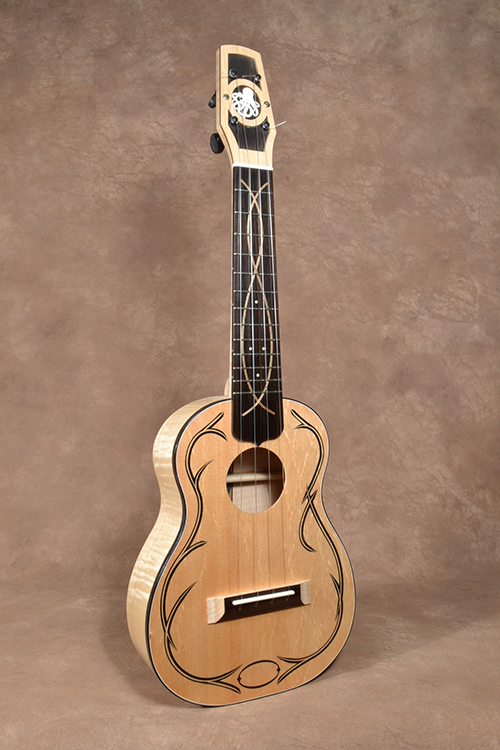 The bridge is a pinless,string-thru style and is maple and ebony. The fingerboard is ebony with an inlaid maple and ebony nouveau swirl and clay position markers. A watchful octopus is captivated and framed on the ebony background of the peg head. Planetary geared Peg Head tuners make tuning accurate and easy. These full size-concert size instruments that I make tend to be tenor like with a smooth warm strum and sizable sustain. This one has a nice even flat response across the strings and a sustain that likes to linger. Maple and Sitka generally is a winning combination of woods and it is so here. Overall length is about 23” and weight is approximately 18 ozs. The instrument comes in a hardshell case. Price is $1100 + shipping + tax in the state of California.